Americans love eating out. According to the USDA’s food expenditure data, millennials spend more than 44% of their food budget on this meal option. In addition, other data proves that Americans spend a lot more on restaurants and bars ($54.86 billion) than they do on their groceries ($52.5 billion). We Americans really like our restaurants. Who can say no to delicious food that’s served and prepared for you by someone else? And best of all, there’s no crusty dishes waiting for you to scrub at the end of the meal. 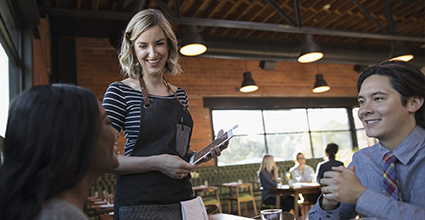 Dining out with family and friends is a wonderful experience, but it can take a huge bite out of your budget. No worries—we’re not going to try convincing you to give up your favorite fast food joint or Thai restaurant. Instead, use our hacks to bring your bill down and continue enjoying meals at your favorite eateries. When looking at a menu, most people’s eyes naturally drift to the right. Restaurants know this and they purposely put their most expensive items on the right side of the menu. Outsmart this marketing ploy by checking out the left side of the menu for cheaper options you’ll still love before looking right. You may find that the restaurant has listed their appetizers in that left area. For many, an appetizer can make an entire, and lower cost, meal option. The beginning of the week is slow for the restaurant industry. Most eateries will offer their best-priced specials on Mondays and Tuesdays, including steep discounts on expensive dishes and all-you-can-eat buffets. Restaurants know the entire world will be taking their moms out to eat on Mother’s Day and their significant others on a date on Valentine’s Day. To make these days super-profitable, many eateries only offer fixed-price menus for these days. These menus might sound cheap until you consider that the four-course meal going for $55 is a lot more expensive than the $18 entrée you’d have ordered otherwise. If you’d really like to celebrate these special days with a restaurant meal, consider eating out the day before or the day after the holiday. Pick up food from your favorite eatery and then enjoy it at home. You’ll save on server tips, beverage costs and many extras, too. To make it super-cheap, only purchase the entrée. Roast some veggies and potatoes at home for a quick side and crack open that tub of rocky road ice cream in your freezer for dessert. Prefer eating out for the ambiance? Create your own at home. Dim the lights, put out some scented candles and set the table with your best stemware and china dishes. If you’ve got little kids at home, wait until they’re asleep to enjoy your romantic meal with only your partner for company. Restaurants are notorious for marking up beverage prices. That can of Diet Coke you always order along with your meal costs the establishment anywhere from $0.05 to $0.25. And they have the audacity to charge you more than three bucks for it. If you’re talking alcoholic beverages, the markup is even more insane – sometimes higher than 600%! Don’t bust your budget on beverages. Ask for water and you’ll save a pretty penny on your final check. Never leave home for a restaurant without first checking for online deals and coupons. Visit the eatery’s website and then check out restaurant deal sites. The best are usually Groupon, LivingSocial, Restaurant.com, and OpenTable. A few minutes of browsing can shave as much as 25% off your bill. Instead of ordering individual portions that look like they were created for giants, split an entrée with your dining partner. You can always order cheaper appetizers or side dishes afterward if you find it’s not enough. It beats paying for food that’s going to end up in a doggie bag. If the restaurant allows, order from the kids’ menu. The food items for little tikes are always priced better, and you might find they’re large enough to keep you satisfied. You can also choose to order two options from the kids’ menu and still come out less costly than buying an overpriced item meant for adults. It takes our stomachs a while to get the memo that we’ve had enough. Don’t order dessert immediately after scraping your plate clean. Wait a few minutes and you might just find that you’re so full you can’t eat another morsel.